Link to page on the Loire à Vélo signposted bike route from the Atlantic to Nevers, which is part of Eurovélo 6 from the Atlantic to the Black Sea. Click here. Eurovelo 6 includes the Loire à Vélo and continues from Nevers through the Burgundy wine region to Alsace, Switzerland, Germany, Austria, Slovakia, Hungary, Serbia and Romania. I have biked in the Loire valley four times now, most recently in May, 2016, and visited four times by car or train. I've vosoted most of the famous Chateau of the Loire and ridden most of the length of the Loire from its mouth to its headwaters. Hopefully, then, my opinions below be useful in deciding upon, and planning, a Loire bicycle trip. Nature of the Ride: The Loire, France's longest river, flows in an arc of some 600 miles (1010 kilometers). From the mountains of the Central Massif of France it slowly descends first north, and then west to the Atlantic Ocean. 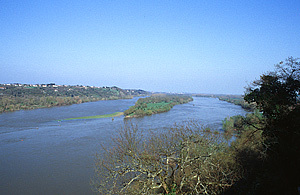 The Loire mainly lies in flat broad valleys or among low hills, where the cycling difficulty ranges from easy to moderate. 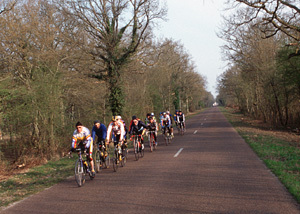 Bike paths and biking itineraries on minor roads cover some 750 kilometers of the Loire (about 820 miles of bike path). The bike paths reach most, but not all of the important tourist sights in the valley. The others can be reached by minor roads. Even though the Loire River itself can be charming, most riders will dirct their attention to some of France's most popular tourists sightsthe Châteaux of the Loire. Commercial bike tours of Loire Valley normally target the central part of the Château region, 60 miles in length, usually in relaxed, easy loop trips of four to six days. If you are self-organizing your Loire trip, I suggest that you strongly consider doing the same. 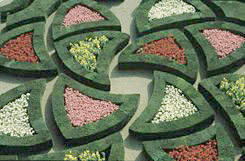 You will find the greatest concentration of sights with the least effort. If you are an adventurous rider with more time, however, you may find it rewarding to undertake a point to point trip, including the mouth of the Loire and even a bit of adjoining Brittany. You may even choose to continue to the Loire's hilly headwaters in central France, or to undertake a European exploration on the Eurovélo 6 route, crossing France, Switzerland, Germany, and part of Austria as far as Budapest in 1500 cycling miles (2,500 km) , or to the Black Sea in Romania, another 1,000 miles (1,600 km). In Part II that follow I suggest four different easy trips in the Châteaux region, as in a separate entry, discuss a point to point itinerary that follows the entire length of the Loire. (You can select the parts you wish to ride.) Those intrepid readers who wish to undertake a cross France or cross Europe trip, starting from the Loire Valley, will on that page a discussion of Eurovelo 6..
Below: Sunday bike outing near Chambord. Please refer to this site's home page for links to important background on touring styles, transportation of bicycles, bike types, rentals, maps, information sources, packing, and security and safety tips. Refer to this page for information on French pronunciation, French bicycle nomenclature, and French road signs, and this one for my traffic rating sytsten. When to Go: The best weather occurs from June through September. Rain is more probable before and after this period, and is least likely in July and August, but this period is subject to possible heat waves. As one approaches the Atlantic, the climate becomes more moderate, and also rainier. Distance and Time: Anywhere from 50 miles and 2 days, to 800 miles and three weeks, depending upon your interests, preferences, and detours. If you are contemplating a cross-Europe bicycle tour beyond the Loire Valley, a no-detours trip from the Atlantic Ocean to Budapest, Hungary will cover roughly 1,500 miles and take perhaps two months. Another 800 miles brings one to the Black Sea. Brief History of the Loire Valley: 9th CenturyPowerful nobles build feudal fortifications. A few centuries later, the counts of Angers (lower Loire) marry into English royal family and become Kings of England. Already att that time, the English kings possessed dominions in France (as they had originally conquered England from French Normandy), and so they now owned a great part of France and claimed the rest. Many wars ensued with the Paris-based kings who also claimed France. By the early 15th century, after losses and gains, England had captured most of France, including Paris, but not the Loire Valley east of Tours. The Paris-based French kings, fleeing the English, came to that part of the Loire valley. 1429 Joan of Arc defeats the English at Orleans on the Loire, and elsewhere, and forces them to leave France, except for the Bordeaux region. 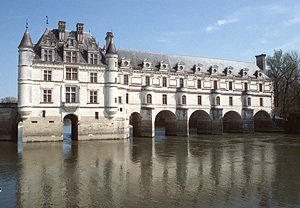 The French kings continue to live primarily in the Loire Valley. They modernize their defensive châteaux . 16th century Several French kings fight (and temporarily rule) in Italy They bring back to the Loire Valley Italian architects, designers, and painters, including Leonardo da Vinci. 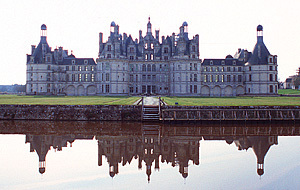 Many Loire châteaux are built or redesigned in the Renaissance style. Middle 16th centuryCatholics and Protestants fight the Thirty Years War in Loire vally (and elsewhere). Outbreaks of plague follow. The French kings moveback to the Paris region. 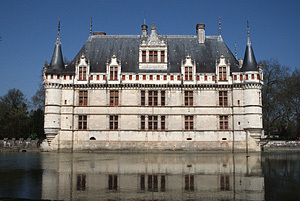 The Châteaux of the Loire became beautiful relics of a bygone era. Below: The Loire River above Nantes. Attractions: The highlight of any bike tour will be the fabulous Châteaux of the Loire  many quite wonderful, different in style, yet somehow all of the same cloth. 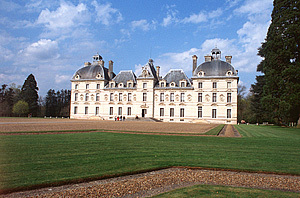 Most of the Châteaux were built during the Renaissance to replace earlier feudal forts; but some feudal castles remain. In addition to Châteaux, the chateau region contains attractive cities and towns, charming countryside, art treasures, and delicious cuisine. I give this itinerary a ranking of "very good" , only because I find the biking in the generally flat to rolling agricultural terrain of the central Loire region a bit monotonous. 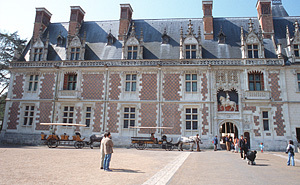 However, most people, and probably you the reader, are likely to find this tour to be "excellent", particularly if you wan easy riding without traffic, love touring castle; or if you are limiting yourself just to the Chateau circuit around Blois; or if you are going to Angers and love art (world's best old tapestries; or if you are new to France; or if you want to stay in Chateau Hotels and dine at gourmet restaurants. Guidebooks and Internet. Sites: The author strongly suggests that you obtain one or more guidebooks on the Loire Châteaux and the surrounding region, to aid both in the planning and in the enjoyment of your trip. The following Internet Site, in English or French, also provides many pictures and much historical information: http://www.francebalade.com/indexen.html. Do you want to read reviews of the Loire Chateaux? Here is the page on Trip Advisor. Angers*** Medieval fort containing the one-of-a-kind, stunningly beautiful Apocalypse tapestry***, finished in 1383 (earliest extant tapestry), now in many panels, and over 100 yards long, as well as 20 feet high. The château also contains approximately ten more 15th and 16th century tapestries that are among the most beautiful in the world. 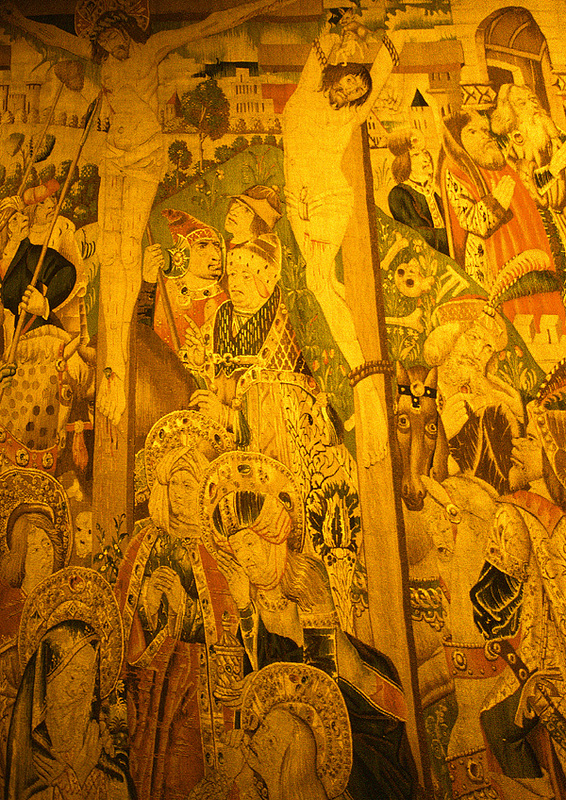 These ten tapestries you can see only by taking a free guided tour. To see all of the above wonders, you must pay to enter the chateau. 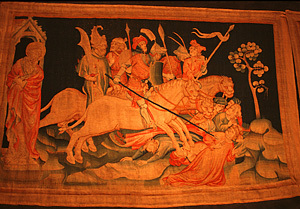 Tapestries rather than paintings were usually preferred by the rich and the powerful of the middle ages and even of the renaissance often preferred tapestries, as you will quickly see on your tour of the Loire châteaux. 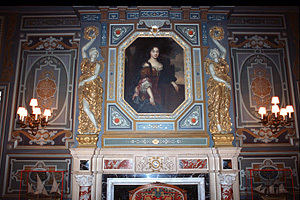 Tapestries on the stone walls of the chateaux provided insulation from the cold and heat. Most of the tapestries have fallen into shreds or completely faded. Arguably, most of the best art of the period has been lost. Though somewhat faded, the tapestries in Angers validate the artistic abilities and taste of that bygone time. Below I have enlarged an excerpt of one tapestry; and I repeat, these are probably the most extensive and striking tapestries you will every encounter in your lifetime. Fontevraud** Listed here though not a Château, Fontevraud is the largest abbey complex remaining in France, and, although unfurnished, the most impressive that the author has seen in France. The huge Abbey church dates from the 12th century. 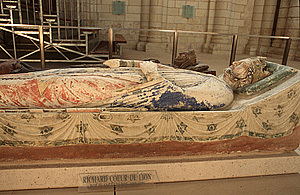 Two Loire Valley Counts who were also Kings of England are buried here, Henry II (Henri IIand his wife, Eleanor of Aquitaine) and, Richard the Lionhearted. Azay-le-Rideau*** Attractive site surrounded by trees and lying on an island between two branches of the Indre River, attractive facade, grand staircase, sumptuous decor with period pieces and tapestries. Villandry*** It is really not the castle that one comes to see, but the beautiful formal gardens, mainly in the Italianate style of the 16th century. Cheverny*** (Also pictured above.) Beautiful surrounding park, beautiful exterior facades, incredible richness and beauty of the original early 17th century, decorations and furnishings. Cheverny interior: This is one of the only Loire Chateaux with original furnishings. Highly luxurious and yet tasteful. Blois*** Location on hilltop, beautiful exterior facades, interesting interior decor, including especially the restored original wallpaper and tile floors. Chambord***  Beautiful, extensive surrounding park and woods, incredible size, beautiful exterior facade, unbelievable architectural elements, including double helical staircase and roof, but few furnishings, which are not original. La Baule** Not in the Loire Valley, but due west of it (west of Saint Nazaire by 16 kilometers-(10 miles), I recommend staying there a night or two before setting out along the Loire in a point to point tour. It gives you an early morning start and is a a fine contrast to the rest of the trip. La Baule has a beautiful, wide and lengthy, beach (said to be the best in Europe), charming shops, a daily market, and many wonderful Victorian style houses. From La Baule a bike path leads near the Marais Salants (salt harvesting pans) by route D92, then west to Le Croisic* (fishing boats), coast circuit via Pointe du Croisic, Batz-sur-Mer, La Baule***. I no longer advise visiting Guerlande,the Briare and Kirnet by bike because of heavy traffic out of La Baule in that direction. Nantes***I enjoyed the view from the ramparts of the fortress Château (which one passes as one cycles through town). The town has excellent bicycle lanes, and there is really no need to bypass it. There are several good museums and a cathedral, none of which the author has seen. 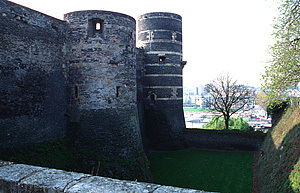 Angers*** In addition to the Chateau*** and its textile treasures, discussed above, there are many other sights, and a very attractive shopping area in medieval-era streets. Bike access is by bike lanes on city streets, which fortunately have only moderate traffic. Saumur** The center of the town has charm, there are several interesting churches and buildings; the Chateau (whose interior I haven't seen) has a dominating placement on a bluff. Chinon** The view of the town and château on its cliff from from across the Vienne river is wonderful, and the medieval town has great charm. I have not visited the château**. Amboise** Strewn along the ramparts of the imposing château** (which I haven't visited), the town has great charm. Tours**–– The main sights of Tours, according to Michelin, are those of big city, the pedestrian streets around Plumereau Square with restored buildings, the Cathedral Quarter, and two museums – the Fine Arts Museum and the Musée de Compagnnonage (craftmanship). Blois*** The very impressive château*** is described above. The town lies on hills, is charming, and has many shops. It makes a fine spot to begin or end loop tours in the nearby region. Orleans* Though not a tourist town or a place to linger, still the center of the town is monumental and impressive. Sights include a fine arts museum**, the cathedral, and a restored house where Joan of Arc stayed. On the south bank of the Loire, not very far from the through bicycle route nearby Orleans lies the Floral Park of the Spring (Parc Floral de la Source)** on 86 acres. The signts and the towns further upstream are noted in the point-to-point itinerary pages: In general, though, upstream (east) of Orleans, the Loire valley, for a time, becomes less interesting. The Châteaux end. Towns with hotels become farther apart, and fancy hotels and restaurants are rare. On back roads, traffic is very light, and outside of the towns, there is nary a cyclist to be seen. (This may have changed since I rode the route, with the near-completion of the Loire bicycle route.) Wonderful one and two star attractions do exist, but lie apart by 2 or 3 biking hours. In this section of the Loire you can branch off towards Burgundy, Alsace, Switzerland, Germany and further east. Towards the headwaters of the Loire, cycle touring becomes challanging: First there are some gorges to pass above, with some long, steep hills and good views. Somewhat further, you should spend at least one night in Le Puy-en-Velay***, at an altitude of 2,000 feet (630 m), the official beginning of the most famous of the Saint Jacques of Compostelle pilgrimage routes in France. (See this site's pages, Directions to Bicycle the Pilgrims Route of Saint James of Compostella, France.) Le Puy has a wonderful Romanesque cathedral, a perched church, and other high viewpoints. The core of the town still retains its medieval aspect. Ways to Bike the Loire Valley: Join one of the many commercial guided tours that cover the central Loire river valley; take a commercially organized, self-guided tour; or organize the trip yourself. Information on commercial tours may be obtained by searching on the Internet using the terms "Loire" and bicycle or biking or cycling, or by contacting well known cycling or adventure tour companies. Local companies renting bikes and leading tours may be found here: http://www.loireavelo.fr/organiser-sejour-loire-velo/guide-velo.